This may come as a shock to you, but there are plenty of people who don’t like anime, even action anime. These folks are not beyond hope, though. 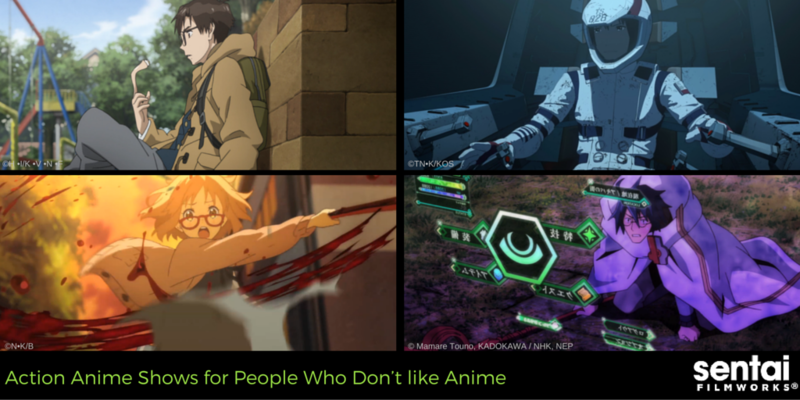 Let’s explore some reasons why people say they don’t like anime, as well as some titles to address them! A lot of people who don’t like anime say that most main characters are the manifestation of, “how cool you wish we could be.” While most anime fans don’t see a problem with this character archetype, many “normal folk” get annoyed with perpetual coolness. You could even say… they find it “unpleasant.” Beyond the Boundary has no shortage of cool fight scenes and interesting powers, but the characters are still wonderfully imperfect and well developed. Why it makes the list: Original action anime protagonists are hard to come by. While Beyond the Boundary has no shortage of standard action antics (high jumps off buildings, physics defying moves, and ridiculous humor), it is refreshingly original enough to keep a non-anime fan intrigued while easing them into anime’s less mainstream nuances. The elevator pitch: Tell your friends it’s like Buffy the Vampire Slayer… with glasses. Some anime critics dislike Japanese animation style and have an obvious bias towards Western styles. Ease these folks into anime art with Knights of Sidonia. It’s an ideal action title for folks who are already into science fiction, and the style of the series avoids the super cute bright colors and enormous eyes associated with the art form. Why it makes the list: If your friends already enjoy sci-fi, like Aliens or Firefly, they’re poised to enjoy their first action mecha anime. Since its set in a post-apocalyptic future, Knights of Sidonia bridges the culture gap between Eastern and Western styles because, in all seriousness, you can’t really tell East from West in Sidonia… it’s floating in space. Duh. The elevator pitch: They’re fighting nearly invincible aliens in the outer reaches of space with really cool technology. The beauty of Log Horizon is that the main character is able to say what the audience is thinking throughout the first episode, namely, “What is happening? !” Shiro wakes up in a real-life version of the video game he plays, and he has no idea why. People who don’t like anime can identify with his disorientation, and it makes it easier for them to get into the story. Why it makes the list: The human mind is enthralled by stories, and the story in Log Horizon is as strong as they come. In addition to the mystery of trying to find out why the characters ended up in the video game world, the viewer also gets to watch a very human struggle to adapt. The elevator pitch: Imagine suddenly waking up inside of your favorite MMORPG and all of the struggles you’ll face in that world. Parasyte –the maxim– is a newer anime horror series with a strong story, great action sequences, and a compelling script that brings up all the existential questions you really need to be asking in life. This series is filled with relatable, normal human characters, dealing with some very not-normal conditions, namely a secret alien invasion. The elevator pitch: It’s a dark, sophisticated version of the secret alien invasion story, perfect for people who liked movies like The Thing and Invasion of the Body Snatchers. Akame ga Kill! is one of your safest bets to lure non-anime fans. It’s deeply political and backed by a strong story, with even stronger characters. The plot is deceptively simple: a country boy goes to the city to make money, only to find himself threatened by the capital’s corruption. What you don’t expect is how gut-wrenching and twisted the story gets as it progresses. Why it makes the list: While the art style and “too cool” anime tropes might threaten to turn off some viewers, the storytelling is spot on. It’s a fantasy-action anime series with assassins, cool weapons, and agonizing plot twists. The elevator pitch: This anime is perfect for people who already like fantasy titles like Game of Thrones. It’s also good for folks who like dystopian society stories like Hunger Games. Avoid series with excessive fan service. They’re not ready for all the bouncy-bouncy. Avoid shows that are too pervy, too cute, or too weird. Again, people who don’t like anime are expecting these stereotypes. Pick an anime series with strong plot lines. A good story is the benchmark for creating (and keeping) new fans. Select a series with great animation. The spectacle alone might catch their attention long enough to draw them into the series. What action anime series would YOU suggest to your non-anime fan friends? Let us know on Twitter, Tumblr, or Facebook!